I'm feelin' the itch for some happy art feelz, gang, and thanks to MegaCon I have LOTS of new artists to share! So come, come. Browse with me. Only a dragon could be this disgusted by surprise chocolate. Ha! 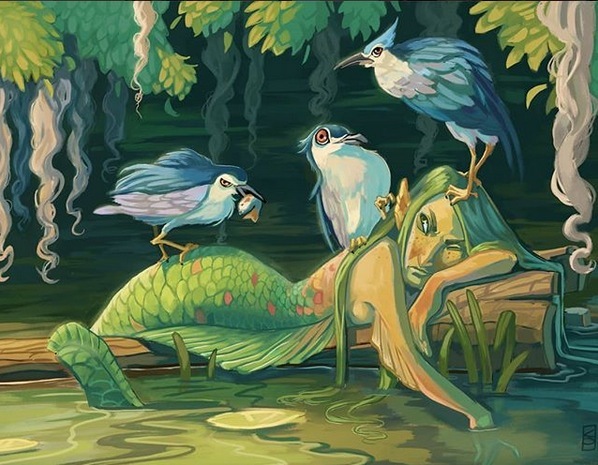 And look at this grumpy mermaid getting a birdy wake-up call! Bahahaha! Hard to see here, but there are lots of fun details hidden inside, including the White Rabbit, Caterpillar, & Cheshire! Go see Karl's Etsy shop for more! 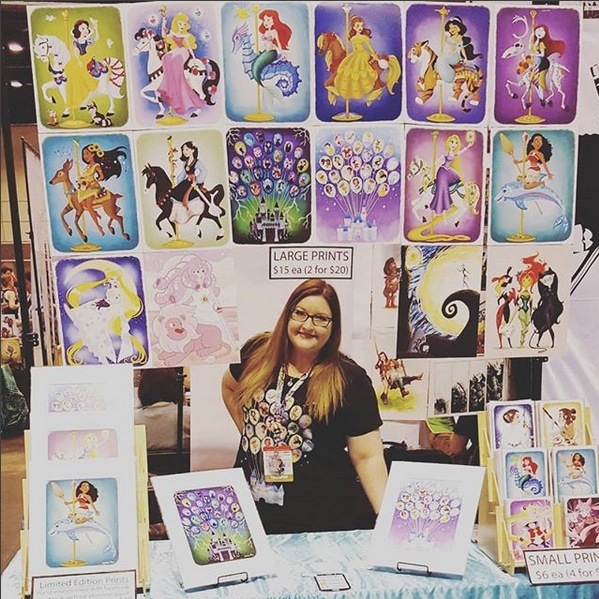 Go browse the rest of Danamarie's prints here on Society 6, or head to her website store to see ALL her goodies, which includes plushes, pins, original paintings, and more. How cute are these?? Go pre-order them in her Etsy shop - she's shipping next month. So be sure to mention in your comment if like either/both of these, so I can enter you in those drawings, too! I'll ship anywhere, so internationals are welcome. I'll announce all four of my randomly selected winners in my very next post, so be sure to check back! Any unclaimed art will go to the fastest commenter on Facebook, so follow me there, too, for last chances at free art. :DUPDATE: The give-away has ended! And my wild card winner is Becky Laparra! Congrats, you four, and please e-mail me your mailing addresses! Such great stuff! 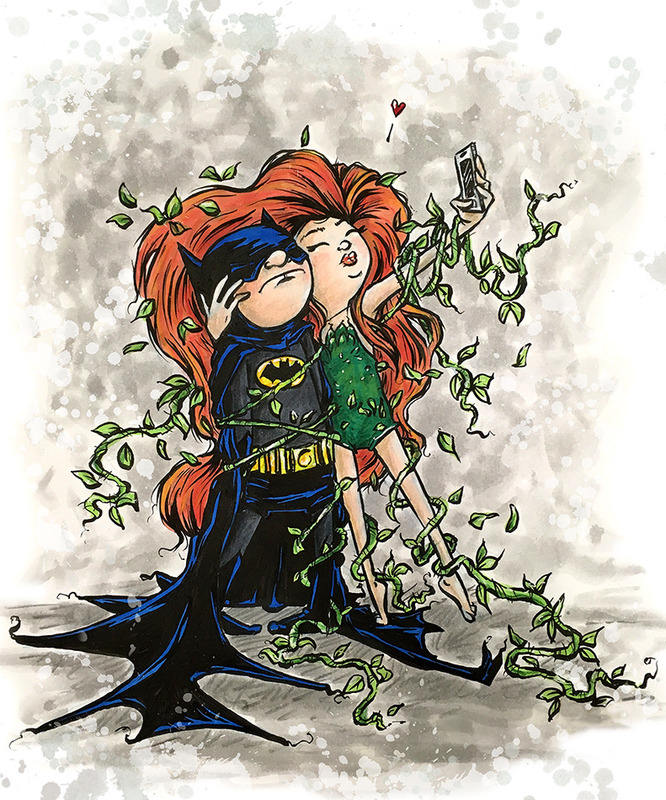 The Poison Ivy selfie is amazing. I would love to be in all the drawings. Thanks Jen! Oh wow, I love those silhouettes! You always find the cutest stuff! Those silhouettes are amazing! I'd love to be entered in the Doctor Who drawing! I love that Hermione! The art style reminds me of Calvin and Hobbes. Cute finds! Put me down for either the Tardis print, or the wild card. Thanks for being you! Steampunk Octopus Dance is amazing! So cute! I would definitely need her in my office, I think. Oh my, that dragon is precious! Thanks for sharing! I'd love to be entered for the doctor who print! That castle with the lanterns is amazing - just gorgeous! Thanks again for sharing! Pick me for the Doctor Who or your give away board. Thanks! So many smiles generated on my face with this post! Love it all! I also would like to be entered for the Doctor Who print. Thanks! These are all fabulous! 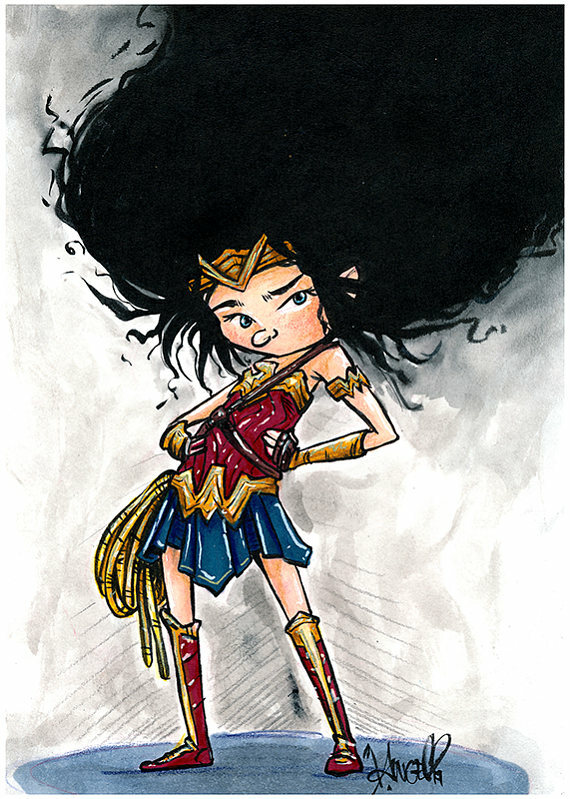 I'd love to win either "Hello Pony" or "Art Nouveau Wonder Woman" from the Pinterest stuff. Or the Steampunk Octopus Dance for the wild card! I LOVE the doctor print. I’d like to be entered for that please!! It’ll go great in our new house! And I would have such a hard time picking from your art board right now, you have some awesome ones! I'd love the "Listen" one too. I just watched that episode this week. I love the steampunk octopus picture! Oh my goodness, I'd love to be entered to win any of them this month. 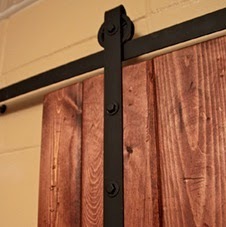 Both of the options in the post have been on my wish list, along with many on your art board. Thank you for the chance! Please enter me in the drawings for the giveaway board and the Doctor Who print! Thanks!! 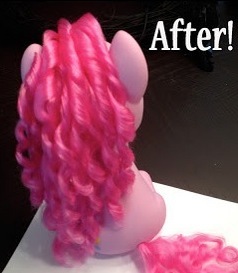 I'd love to be entered for the general giveaway as well as the Steampunk Girl one! These posts always brighten my day. I recently went to the local anime convention and my favorite part was seeing all the beautiful artwork! The TARDIS is swoon worthy!! Want it all, jaw dropping creativity. I love the dragon print! Who says no to chocolate? Please enter me in the drawings for the giveaway board and the steampunk octopus! Some truly fantastic stuff this month! As far as the bonus ones, DOCTOR WHO! DOCTOR WHO! DOCTOR WHO! I appreciate your enthusiasm in sharing stuff that makes you smile. I'm partial to Doctor Who, but I'd also like the steampunk octopus girl. 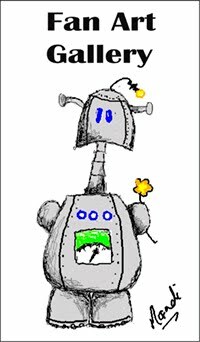 My 13-year-old told me last night she'd like to create a steampunk costume for Halloween this year. Yay, her! I adore the steampunk octopus- I have a nearly identical ceramic one that I painted (in it's prior life it was gaudy gold). I also love the Etsy and StoneEnvy toothless prints. All of the art you share is so wonderful! Thanks for doing this Jen. I appreciate you finding all this cool stuff. I'd like to be in the drawing for the wild card and for the Doctor print. OMG that TARDIS! LOVE! Please enter me for the TARDIS! 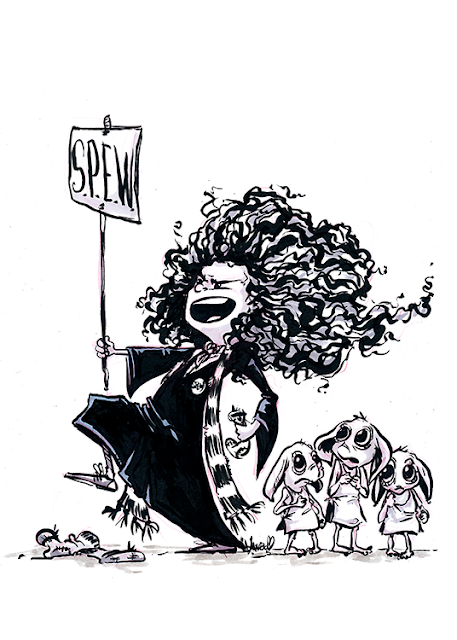 I love Hermione, she reminds me of something out of Calvin and Hobbes. Please enter me in all three drawings; I'd love to put Listen in my classroom! The bee print is adorable! Thanks for finding yet more ways to use up my monies.... Both of the wildcard entries are great but I really like the Dr. Who. No one can buy ALL Isabelle’s prints anymore, one of the ones I got was the last one in stock (sorry to the people who also had it in their carts!) Fantastic round up this month!! Please enter me for all the things! I don't think my comment posted, so apologies if this is a duplicate. I would love either the Steampunk Octopus or the Doctor Who piece. Thanks for sharing the art and the artists with us! Please enter me in all the drawings! Thank you! I love your art round ups! It's so fun to see what's being done out there. 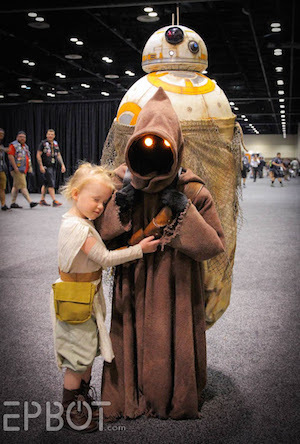 I love to show them to my geeky artist daughter, too. :) I'd love to be entered to win either print. Either Wonder Woman with the frizzy hair or the pretty Small-World looking Disney Castle with the tiny Walt and Mickey silhouettes. Wildcard and steampunk octopus, please! I love you guys! Your blogs are the best and I am always putting stuff aside to send but by the time I get around to it, I may just have to rent a truck and drive the load down myself. I love your taste in art Jen and your style inspires me. I'd love either of those two prints. They've both been on my (grabby hands) want list if I ever managed to win one of these. I love Dr Who and I love Steampunk. Art! And I LOVE Steampunk Octopus, so please put me in the running for that one! That bee is killing me with cute! Also, I would LOVE to have the Doctor Who print for my awesome son. Thanks for the art roundups and giveaways. So much eye-candy every time! Oh my goodness! Such generosity and so many beautiful goodies to pick from!! I’d love to be in the wildcard or Steampunk Octopus Dance drawings!! Thank you for such a wonderful blog!! Love all these, especially the dragon with the chocolate coins. I would love either the steampunk girl, Doctor Who, or Wildcard art picks. Love these art round ups every month. As always you find the best stuff! Particularly love the princess carousal series. Also love the steampunk octopus dance! Oh my gosh I am in love with that steampunk octopus print! squee! I always love the art roundups, I get so much inspiration! I would love to be entered in the drawings for the steampunk girl, doctor who and wild card. I like the steampunk octopus dance! 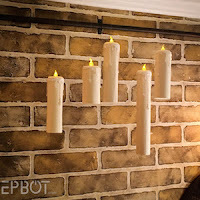 It is so cool! I love both of those!! I love love love so many of the wild cards, but the steampunk octopus is great, too! Also. This month you've outdone yourself. Those castles. 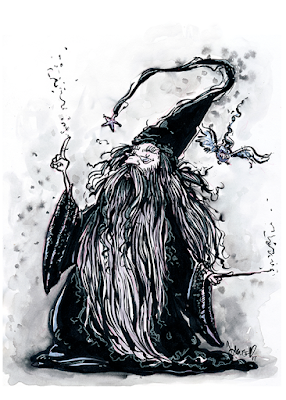 Hermoine. THOSE SILHOUETTES. I'd super love one of the steampunk girl ones. 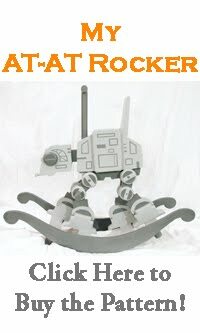 It'd go perfect in my living room! What a great roundup! Love everything! Please add me in the drawing for Pinterest board and Dr Who. Oh, so must have art to get me through. Oh, I'd love to be in any of these drawings. I always love your roundups. You find such wonderful art! I'm in love with the Hermione, and all of the ones from Isabelle Angell - they all look like they're part of Calvin & Hobbes' crew - the attitude, and that Calvin gleam in the eyes, lol! Any of the art is good for me, but I do especially like the Tardis print! Love you two, keep on doing you! Oh my, I NEED Steampunk Octopus Dance! My bedroom is a all done in steampunk and octopuses! Basically my whole house, actually! I love it! Wow, I need all of these. And I'd also love to be entered for the two extra picture drawings as well! There's so much great stuff this month. It was hard to choose a favorite, but I definitely fell in love with the carousel art! That Hermione is so good!!!!! Ahh!! Great finds this month :) Would love to be put in for the regular drawing and also for the Steampunk girl and octopus. Thanks! Please enter me for the wild card and the steampunk girl w/octopus! Yay for more art goodies! 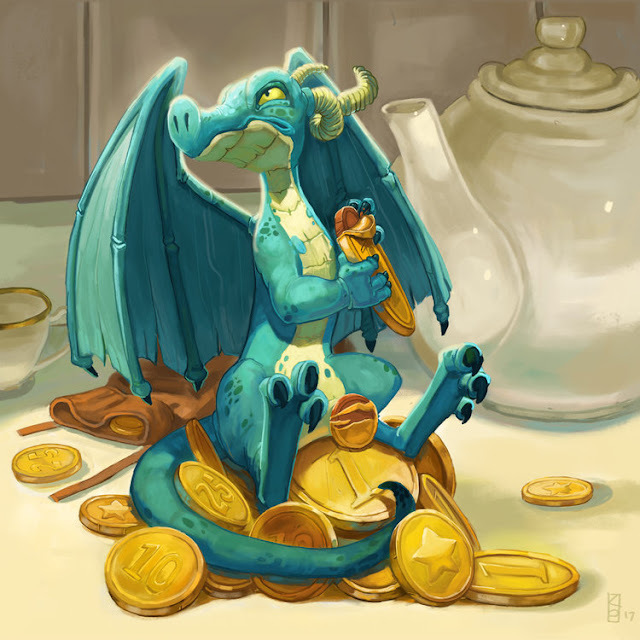 I LOVE that dragon with his chocolate coins! Please enter me for the wild-card and both of the extras! Love that grumpy Mermaid and the Disney castles! Please enter me for the wild-card! Absolutely gorgeous work, I know what the rest of my afternoon will be filled with! The steampunk octopus is just too cute!! So I just spent quite a long time looking through all your links. I want them all!!! I would love to be entered in both giveaways please! Please enter me in the wildcard drawing. Thank you! Those castle prints are EVERYTHING!!! So much joy and loveliness. 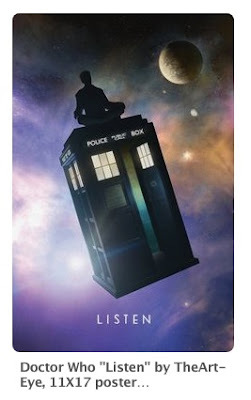 I do love the TARDIS Listen print! Oooh, I love the Park Sweeties & Carousel Princesses! The Dr. Who, the octopus, the whole board! Yes, please. I love the Park Treat Sweeties! Please enter me in the wild card drawing! 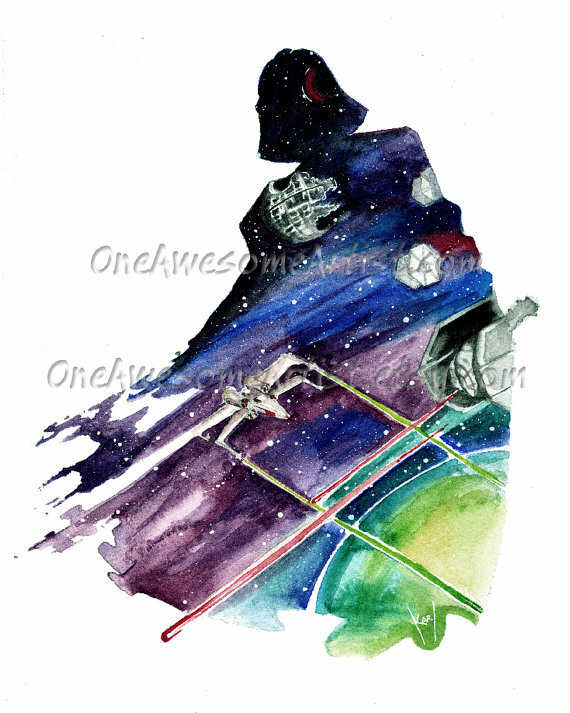 Love the Darth Vader art! So gorgeous! Wild card and TARDIS please! You always find the best art! I love the Labyrinth print. I love your art posts. I never see any art like this in my quiet life so I have to live vicariously through your posts. That Dr. Who poster!!!!! I love love LOVE the Carosel Princess series! I would like to enter all the drawings please. You always have such great art. I'd like to enter the general drawing and for the steampunk octopus print, plz! Oh gosh, that Hermione is perfect! But that castle prints... I want them all! For the giveaway, I love the Doctor Who print :) Thanks for another fantastic art roundup! They're all fantastic. I love your roundups! Pick me, pick me! Dr. who please. Pick me, pick me! Oh gosh! 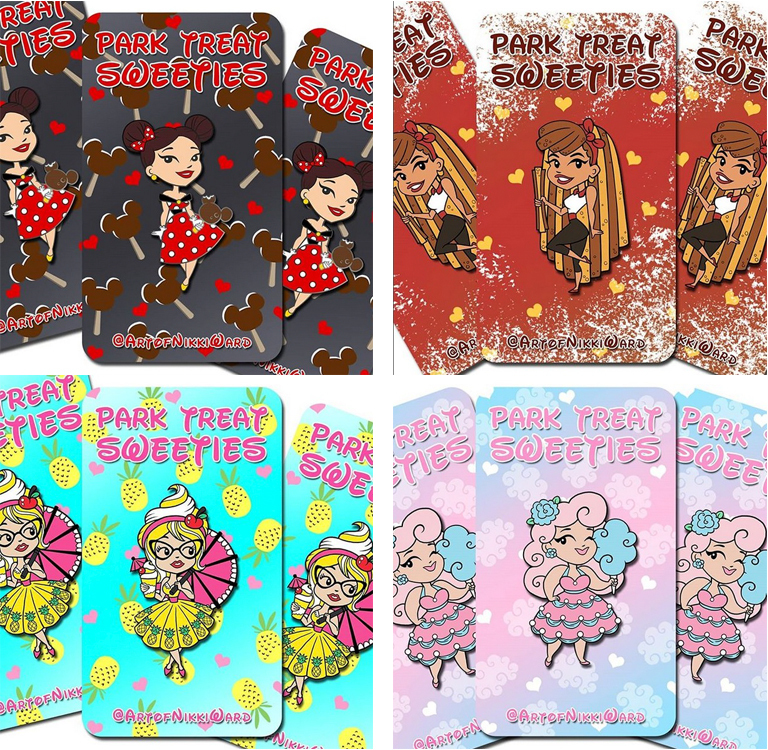 Love those carousel prints, and the park sweeties! Thank you for sharing! I would love to add that Tardis print to my growing Dr Who shrine. Thanks for sharing these artists. I love it when you share different peoples artworks with us. You always find the greatest things. I love both the steampunk girl and the tardis art prints. Wow all of these are so beautiful! Put my name in for all of the drawings. Im so in love with that Tardis print! Jen, you have such a good eye and I always adore your art roundups, and love how much you support and encourage artists. I usually don't enter for the drawings since I have limited wall space, but I love the Steampunk Girl and would make a spot for it! God, I need to update my birthday wish list FAST. These are all fantastic! 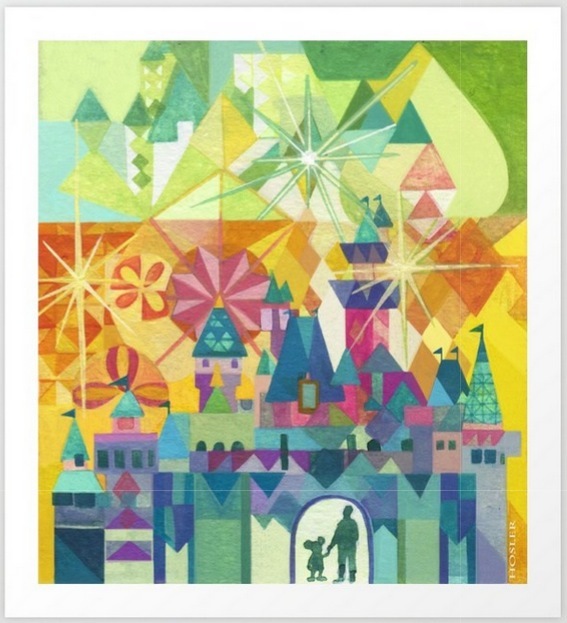 Love those Disney carousel prints! Steampunk octopus dance! Love these art round ups... wondering if I could just cover my whole house. Such good stuff! Thanks for sharing! Please enter me in all the drawings. Thanks! Love the Dr Who print! Please enter me in all the drawings, thank you! Pretty! I love the Doctor Who print. Oh my gosh! I kind of need that Doctor Who print! I love each and every one of your art round ups, so if you wanted to do them more often I wouldn't complain �� (no giveaway required). Excellent finds all! Please enter me and for either of the extras as well. Great finds! That grumpy dragon has stolen my heart! I would love to be entered in the draws! I love the Octopus Girl print! All the art is stunning! Please enter me for Doctor Who and the Wildcard! I love seeing the stuff you find! 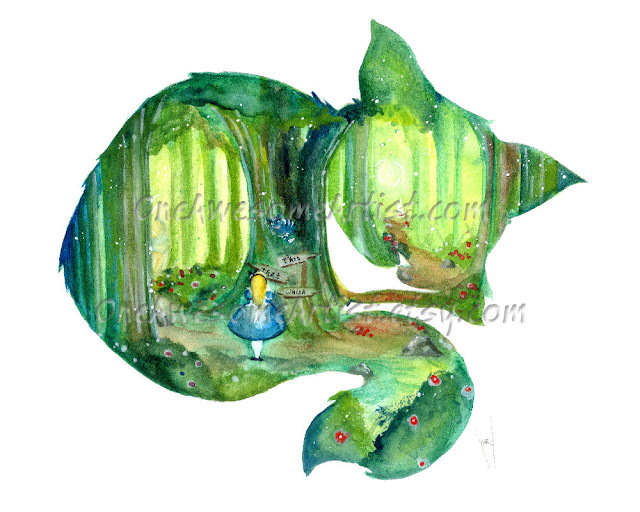 I would love the Flower and Garden art trio, the Trip of Tomorrow or the Boo print from your board. Thank you for your generosity in both the drawing as well as finding all the arty goodness each month! Oh how I adore that grumpy mermaid piece! 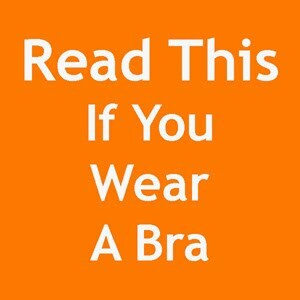 lol That's so fun. I'd love to be entered for wildcard and the Steampunk Girl. Now to go share that grumpy dragon with my kids, they are going to just love him. 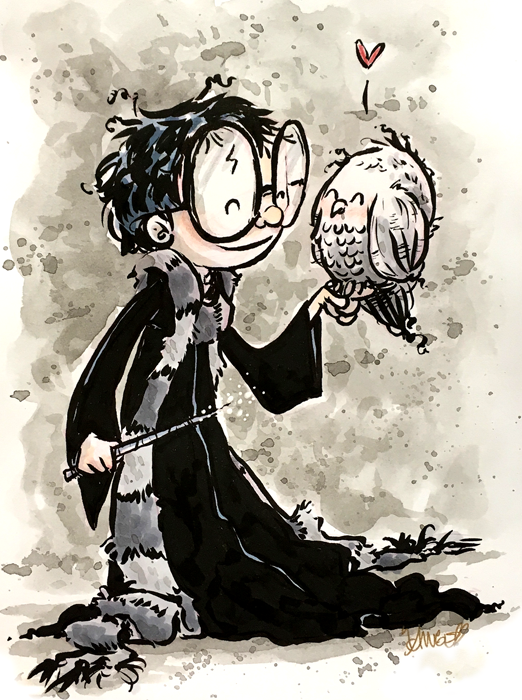 The Harry Potter prints are amazing! 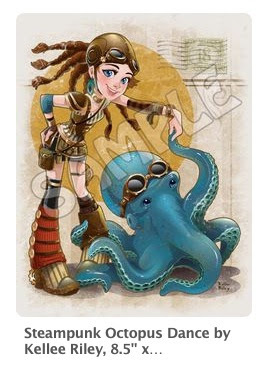 Also totally in love with with steampunk girl and octo since i collect some octopus things! Please enter me in all 3 drawings. Thank you! Once again, you've found some amazing art. Thank you! Enter me for the Octopus Dance, please. Oh my, I would love any of the prints! Thanks, Jen! Ooh, please enter me for everything! I love it all! That dragon, AHHH! Adorable and hilarious. Toss me in the wildcard please! I cannot be the only person who now wants to see a group dress as the Park Treat Sweeties at Dapper Day, how awesome would that be??! 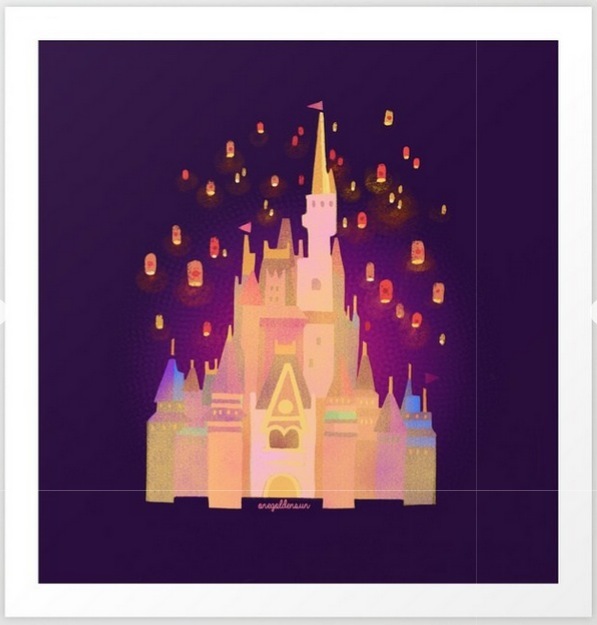 The colors in the castle prints are magical! You're always a great guide for geeky goodness. I'd love the steampunk dance if I were to be that lucky person. Oh my gosh, Hermione! And I love the Doctor Who print too! 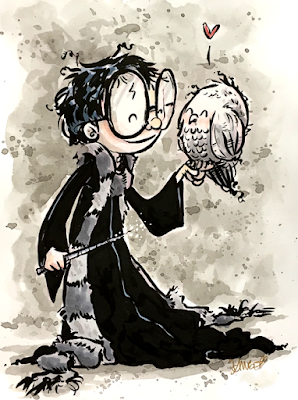 Those Harry Potter prints are so perfect. I luf them. Please put me in the Wild Card and Octopus print drawings. That small Betrayal dragon is absolutely adorable. Those "Park Treat Sweeties"! So cute! Hope I'm not too late to enter. I like the tardis print, too. Thanks for the giveaway! 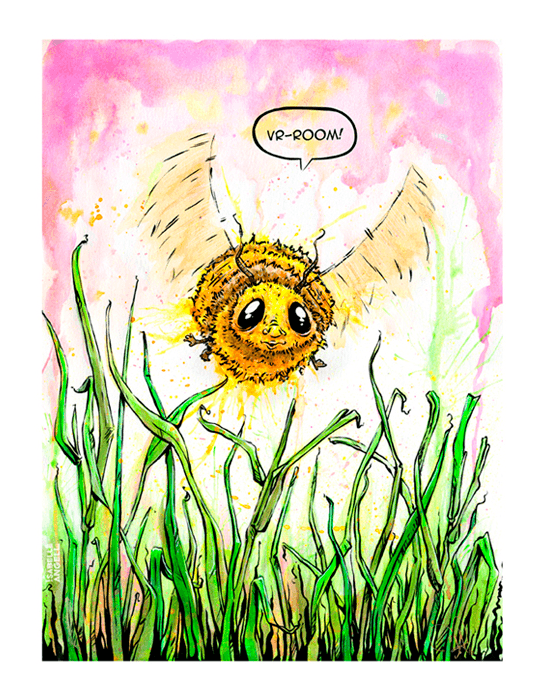 That bee just made my week! :D And I love the silhouettes. Obsessed with that Betrayal print! I would love the Doctor Who print too! I would LOVE the steampunk girl! The art posts are my favorites! Please enter me in the regular give away as well as the Dr. Who one. My husband would love that one! You always find the bestest stuff! Please enter me in all drawings. Thanks! Thanks for showing us all these lovelies. Please enter me in the Listen drawing. Thanks! These are amazing. You always find phenomenal artists. Love! I got my Park Treat Sweeties, thank you for the link! Maybe she'll do a Turkey Leg one sometime! These are all fantastic, but those castles? Swoon! Love the silhouette style, especially the Vader one! Would love to be entered for the Octopus dance as well! Oh dear, you are always finding the bestest things <3 Please enter me for Steampunk Girl or the wild card. I love the Octopus! We have a kind of octopus theme going on in the bathroom- laundry bags and my husband drew me an octopus with different pieces of clothing in each arm! Now we are adding a little bit of art to the bathroom, and this would fit right in! I love that dragon and Hermione! Oh I love these posts, although my wallet doesn't (heh). 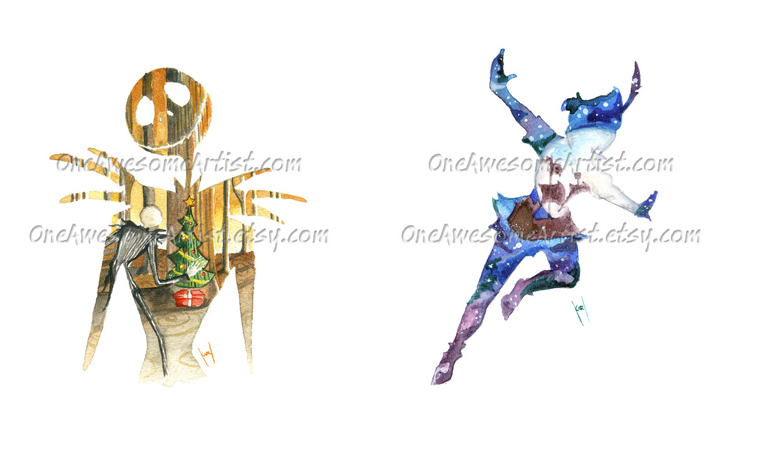 I'd love the steam punk cutie and the Tardis print also! That Betrayal dragon has won my heart though! So adorable! Fingers crossed she adds it to her store!!! I absolutely LOVE your art round up posts! How do you find such amazing art? 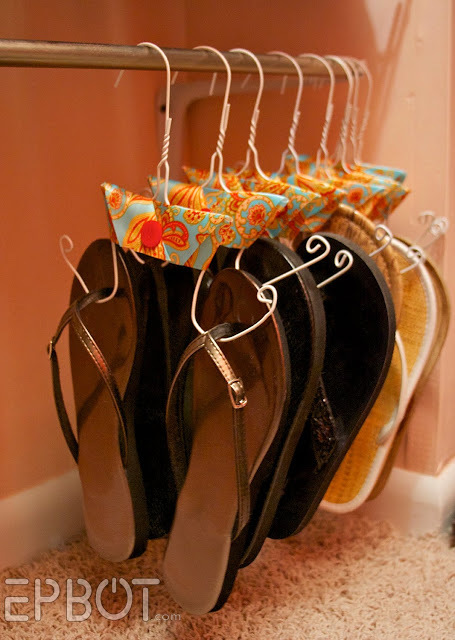 I'm a huge fan of Etsy, but given the sheer volume it can be very difficult to find styles and content I truly enjoy. Any tips? Gmail is diana.karkow if you find some spare time to help a fellow art lover :) Oh, and the steampunk octopus is definitely the best! Everything this month (and probably next month, too) I found at MegaCon; conventions are AWESOME for finding new art. I also follow tons of artists on Instagram, who tend to recommend *their* favorites, so it snowballs. I almost never find new stuff organically on Etsy; it's too hard unless you're doing an extremely specific search for certain fandoms, and even then the search algorithm is a jerk and tends to hide things I *know* are there. Very frustrating! Those silhouettes are all incredible, and I love that poor dragon! Thanks for sharing! I'd love to be entered in the wildcard drawing! You always find the best art! I love them all! I would love to be entered into the wildcard draw, please! Awesome art as always Jen! I'd love to be in for all of the draws! I love them all, but that Darth Vader is my whole world. I would love any of the art! These are amazing. OMG, I love that Darth Vader. Also in love with Steampunk Girl and the TARDIS!! The dragon is so cute! 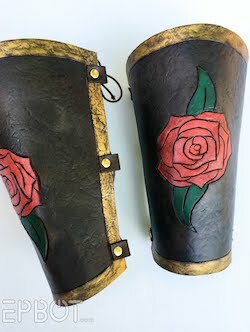 I spotted several things on the art giveaway board that I'd love to win. Great geekery, as always, Jen! As always, this post is bad for my bank balance! 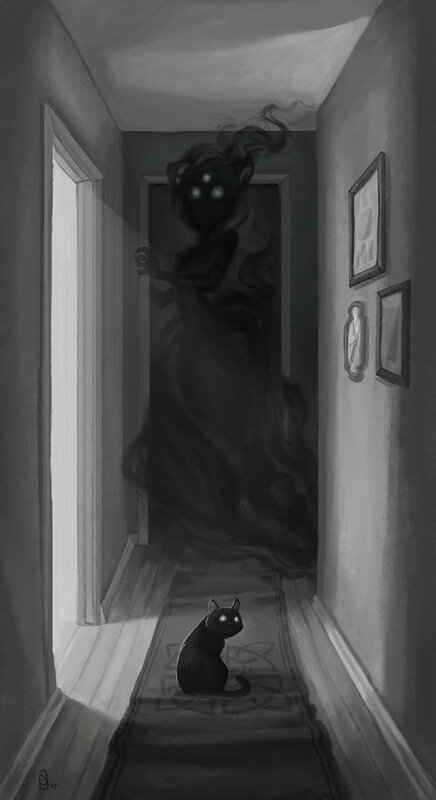 "Told you so" is great - so atmospheric and haunting (with a beautiful black kitty). Sign me up for some Doctor Who! Please enter me in your giveaway! I like both prints but I love the Listen print. I need more geeky art. I need to shop! "Betrayal" by Kristen Pauline is one of the best things I've seen in a long time! Love it! <3 Please enter me in the wildcard and Steampunk Octopus Dance draws :). Squeee! It's art time! I would love to be entered for all three drawings. Thank you!!! I would love to be included in all the drawings please. Thank you. Wow, it's all gorgeous! 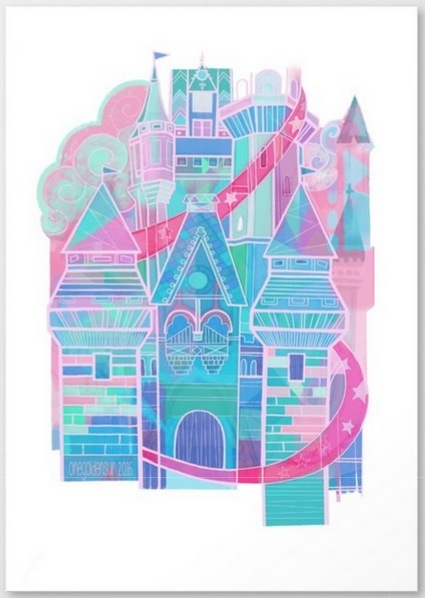 I could see someone buying a bunch of those princess carousel prints and decorating a little girl's room. Or a big girl's room, if I could convince my husband... :D Thanks for the art roundup, you always find the coolest things! I have had my eye on that steampunk octopus for awhile now! :) Those silhouettes are really neat! Yay, all the art! 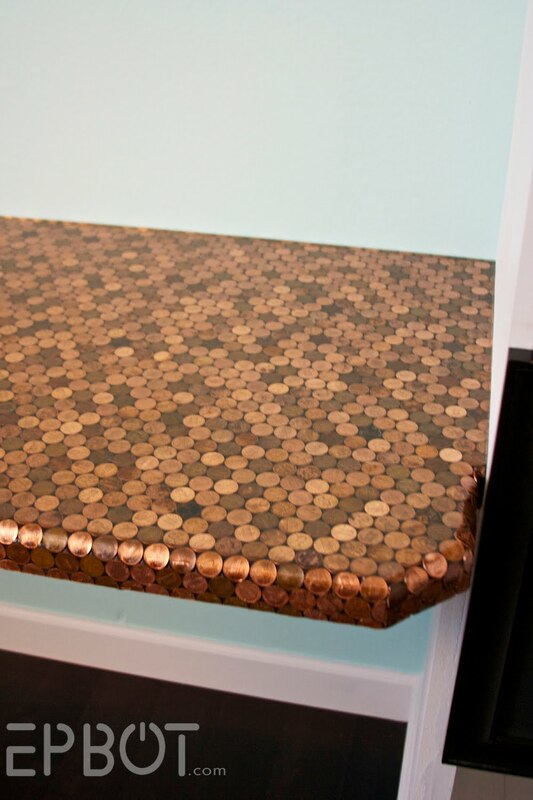 I'd love a chance to win something from the give away board! 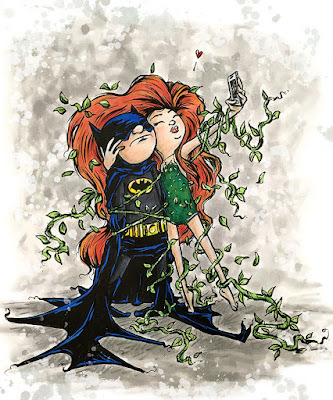 the poison ivy is a stitch, and I like the Dr. Who Listen card for the drawing! I'd like to see a Princess Leia carousel horse. Love those Hermione and elves and of course Steampunk octopus dance! Ooh, enter me for Doctor Who and wildcard, please! Hope I'm not too late. 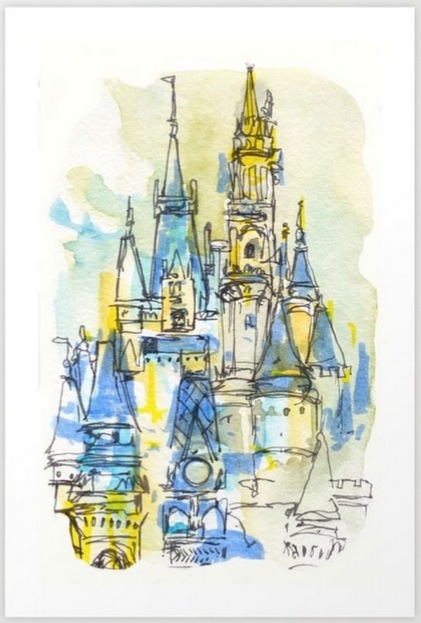 And those castle prints are stunning! Love your art roundups.